KEARNEY – Brooke Carlson isn’t afraid to do the dirty work, whether she’s under the hood of a vehicle, landing a crappie at the lake or setting a screen on the basketball court. 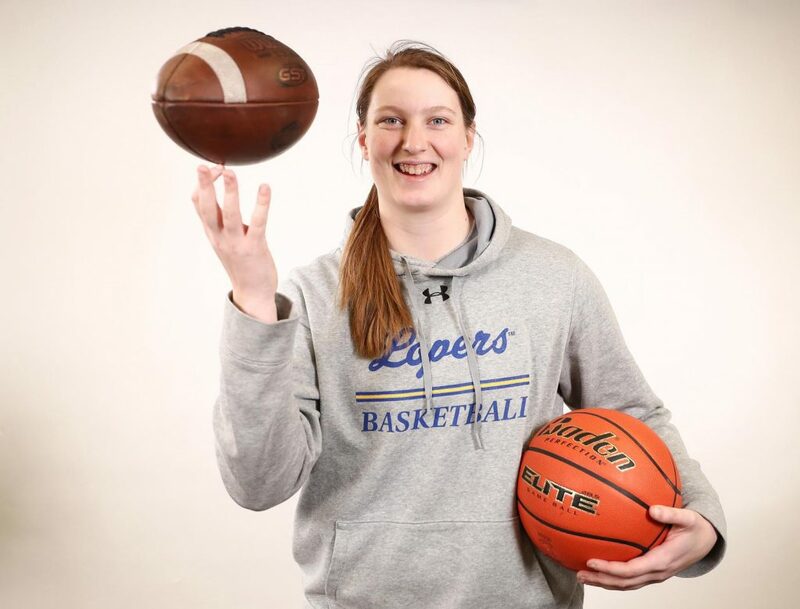 The 6-foot-1 center brings a blue-collar mentality to the University of Nebraska at Kearney women’s basketball team, using her size and strength to overpower opponents in the low post and give the Lopers an advantage inside. The UNK freshman developed that mindset during high school, when she was a three-sport athlete for Elkhorn. Carlson led the Antlers to four straight state basketball tournaments, including a Class B title in 2017-18, when she averaged 13.3 points and 8.2 rebounds per game while earning All-Nebraska honors. She scored more than 1,000 points for Elkhorn and set school records for blocks and rebounds in a season and career. “A lot of times, you see the potential for a big, strong, physical kid to be a good college basketball player, but you know they have to develop that strength and that ability to be physical,” said UNK head coach Carrie Eighmey. In Carlson’s case, her participation in another sport alleviated any concerns about a lack of physicality. Carlson started playing organized football as a second-grader and stuck with it through high school. She was a backup guard on the offensive line and special teams player for Elkhorn’s varsity team. “I knew I wasn’t going to be the best person out there on the field. There are obviously guys who are bigger and stronger than me,” said Carlson, who was also an all-conference goalkeeper for the Elkhorn girls soccer team. The experience challenged her to grow as a person and athlete, giving her the toughness and footwork she relies on during basketball season. Carlson made an immediate impact for UNK, which returned just three players from last season’s roster. 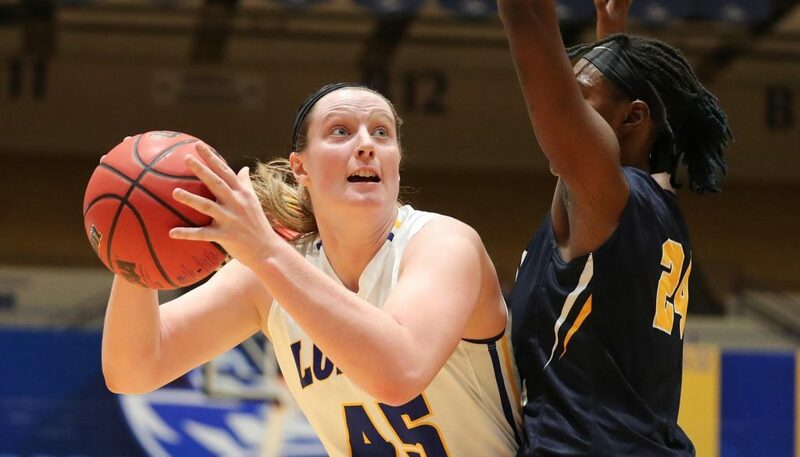 The 19-year-old leads the Lopers in points per game (11.2), blocks (19) and shooting percentage (48.6), and she has the highest free-throw percentage (77.6) among UNK players with at least 10 attempts. Carlson has played in all 20 games this season, starting every contest since Jan. 10. “She’s really just scratching the surface in her growth as a college basketball player,” Eighmey said. Beyond the physical tools, Eighmey is impressed with the freshman’s maturity and her ability to be both a great leader and a great learner. “The thing that’s great about Brooke is she’s an intelligent kid, she’s well-rounded, she’s great in the classroom, she’s going to be great in the community and she’s a great teammate. She’s one of those people who is constantly looking for ways to not only make herself better, but to make her teammates better,” Eighmey said. For Carlson, academics and athletics played an equal part in her decision to attend UNK. “One of the biggest reasons I chose UNK is the coaching. The coaches here care about you as a person and a basketball player, but the person is always first,” said Carlson, whose sister Dani plays volleyball and basketball at College of Saint Mary in Omaha. UNK’s pre-engineering program was another draw. Carlson plans to spend four years at UNK, where she’s a mathematics major, before transferring to the University of Nebraska-Lincoln to study mechanical engineering. Her father and brother are both engineers, and she wants to land a career designing vehicles. “She’s got a unique skill set,” Eighmey said of Carlson, who serves as the team’s unofficial mechanic and freshmen chauffeur. 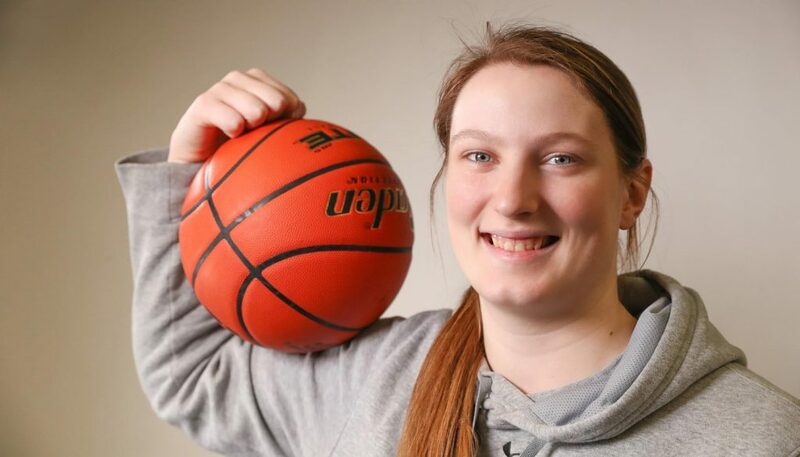 Her GMC Yukon is often loaded with all seven first-year players on UNK’s roster, and she’s always willing to lend a hand by changing a flat tire or popping out a dented door when her teammates call. She can replace an alternator, too, if the situation arises. Carlson will give just about any hands-on hobby a try – she spent winter break working for Brandon Built, a custom furniture business run by former UNK assistant coach Brandon Rohr and two partners – but don’t expect her to tweet about it. That’s something she doesn’t do. “I’ve never been a big social media person,” Carlson said. She’d rather be reeling in that crappie or working on her post moves.